Magnified view of a cross section of the compound Cu2ZnSn(S,Se)4. 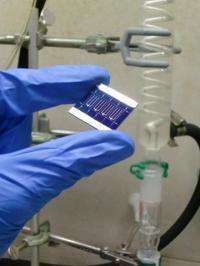 (PhysOrg.com) -- Solar cells could make fossil fuels virtually redundant if they were cheaper, but their use of rare elements and complex manufacturing processes makes them expensive. Now IBM Research has developed a prototype solar cell that solves both problems, using common, cheap elements and using an inexpensive manufacturing process. Their paper is published in the Advanced Materials journal. The new photovoltaic cells are known as “kesterite” cells, which are produced using a printing technology in which a solution containing nanoparticles is spin-coated onto a glass substrate. According to IBM their efficiency is close to that of established solar cells. IBM researcher David Mitzi, who is also manager of the company’s photovoltaic science and technology department, said they wanted to reduce the cost and use more abundant elements for thin-film photovoltaic cells. The current technology uses the rare elements indium and tellurium. Indium is in particularly short supply because it is also used in the manufacture of transparent transistors and is in high demand for flat panel display systems. By contrast IBM’s kesterite cells uses the common elements tin (Sn), zinc (Zn), copper (Cu), selenium (Se), and sulfur (S). The new solar cells are also cheaper to manufacture, using a “printing” technique that uses a hydrazine solution containing copper and tin with nanoparticles of zinc dispersed within it. The solution is then spin-coated and heat treated in the presence of selenium or sulfur vapor. This process is much cheaper than the traditional manufacturing process, which uses an expensive vacuum-based technique. A team at the Nagaoka National College of Technology in Japan produced a thin-film kesterite cell in 2009, which had an efficiency of 6.8 per cent. IBM’s kesterite cell has increased the efficiency by 40 per cent. Mitzi said they are planning to increase the efficiency above 11 per cent, which is equal to or better than the traditional solar cells. Solar cells contribute under 0.1 per cent of the Earth’s electricity supply at the moment, largely due to their expense and the rarity of their key elements. The IBM solar cell could change all of that. IBM will patent and license the technology and says it is open to partnerships with existing photovoltaic cell manufacturers to bring it to the market. not bad, 11% efficiency with common elements and a printing procedure.. especially with IBM's big arm behind it..
"using a “printing” technique that uses a hydrazine solution"
A little problem - hydrazine is extremely toxic, even in aqueous solution. Hydrazine is highly toxic and dangerously unstable with autoignition temperature 24-270 C.
It means, it can be easily ignited even at room temperature or a bit higher. Also wrom Wiki: "On February 21, 2008, the United States government destroyed the disabled spy satellite USA 193 with a sea-launched missile, reportedly due to the potential danger of a hydrazine release if it re-entered the Earth's atmosphere intact"
They even destroy satellites, containing hydrazine fuel, before they reach the Earth atmosphere. 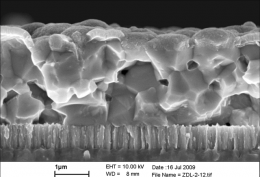 How can solar cell, containig such material, be called a "green tech"? Pb and Cd are a way less dangerous but they aren't used in modern electronics due to RoHS requirements (at least in EU). Hydrazine is used in the solution used to print the chips, and is not a component of the chip itself. This is painfully obvious. quit trolling. Copper and zinc are also becomming more expensive due in large part to the increasing demand by developed and developing economies. This is an excellent step on the path to a viable solution. I say, keep up the good work. "A little problem - hydrazine is extremely toxic, even in aqueous solution"
But Gallium Arsenide is ok with you ? "Hydrazine is used in the solution used to print the chips, and is not a component of the chip itself"
... but the workers will be exposed to it during the production for a substantial time. There are a lot of people agitating against using silicon in solar cells just because the production involves hazardous substances. The same arguments can be applied here. "But Gallium Arsenide is ok with you ?" Do you understand anything about the manufacturing of semiconductors as is done today, all over the world, Zarp? Some of the chemical compounds located in fabrications are deadly at 1:1000000 concentrations to large amounts of people if dispersed into a local water supply. They know what they're doing in these places. OSHA and other regulations make sure that containment and transportation of these chemicals happens in redundantly safe manners. You on the other hand, obviously have no clue. At the risk of sounding foolish, toxicity is overrated IMHO. Develop an effective containment plan and stick to it. Screen workers. Move forward. Gallium Arsenide is used around the world for manufacturing of semiconductors as well, Zarp. Take a few seconds to do Google searches before you post, please. High tech is high tox. I believe this to be inevitable. Do you have a point? The manufacturing of many of the materials you use everyday include chemicals that have toxicities. Along with JayK's statement, the inherent toxicity of all manufactured goods is a result of their natural toxicity. Mercury isn't edible if you dug it up, is it? But that's an overly simplistic view. Toxicity is what it is, and to affix manufacture as the reason for it is ridiculous. "They even destroy satellites, containing hydrazine fuel, before they reach the Earth atmosphere." That sattilite would have never reached ground with any hydrazine left...That could not have been the reason for destroying it...but was a convienent cover story wasnt it? Point, hydrazine has it's dangers, but when used under proper conditions by trained personnel it presents minimal risk. Any good safety officer could set up the operation to minimize those risks and have approperate emergency response in place to deal with the situation when things go all pear shaped. Wow, a exceptional achievement. With other manufacturers claiming $1 a watt soon, This may drive solar panels to $.5 a watt. I'll be energy self sufficient (as long as I have nano-technology to store energy doing the day). Just an FYI: Hydrazine is also a component of Visine, the eye care solution. As has been said before everything is toxic in the wrong amount. Hydrazine is safely used in closed production cycle and most of residue will decompose during subsequent thermal treatment. In life environment hydrazine is oxidized rapidly to harmless nitrogen. In fact it's quite environmentally clean fuel and reducing agent, commonly used as oxygen scavenger in boiler feedwater to inhibit corrosion. A huge amount of hydrazine is used in semiconductor industry already and nobody cares about it.